This topic contains 13 replies, has 6 voices, and was last updated by Dagmar 1 year ago. Volceq can automate time based breakout trading strategies. A box is formed by the highest and the lowest price levels during a certain period. Then we wait for price to break through any of these levels plus/minus a user defined buffer and we open a trade according to the direction of the breakout. You can download it and study the user guide here. Some examples of breakout trading strategies: 0400-0700 GMT Breakout Strategy, 7am-9am Big Dog USD Breakout Strategy, 4H Box Breakout, Simple Asian Breakout Strategy. This reply was modified 1 year, 11 months ago by F100. Excellent and very versatile EA, thanks. Just have 1 question: which modifications do we need to make to make this work on XAUUSD (Gold) chart? 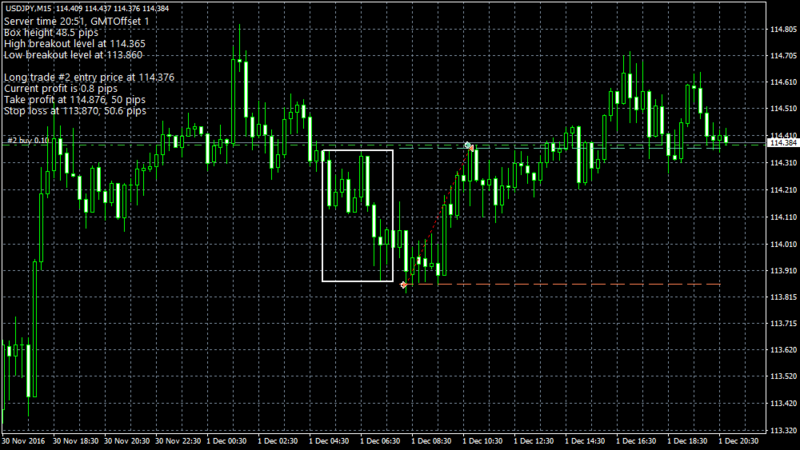 I noticed the box is not drawn correctly on a gold chart, see attachment. Settings were default (OOTB). This reply was modified 1 year, 8 months ago by San4x. Also noticed the box is also not showing properly on all JPY pairs, see screenshot. Are there some settings I am missing perhaps? I am running this on GlobalPrime, MT4 Terminal build 1090. Broker is ECN, 5 digits, 3 digits JPY and 2 digits Gold. I downloaded the Volceq EA from your website, assuming it’s the latest version, seems to be v1.32. Do I indeed have the latest version..? I noticed sometimes it takes quite some time on JPY pairs to draw the boxes, and they’re often incorrect. Same for Gold. Got it to work, great. This EA is excellent. Thanks again for your work. Is there a way to open 2 orders instead of 1 when price breaks outside the box? Most brokers do not efficiently handle partial closes…they close the complete trade and open a new (partial) one. So we’re paying spread twice. There is no such option, only partial exits are possible. Excellent, thanks for the reply…! Where can I download the latest version of the VOLCEQ ea? could you be so kind and add the following feature. volceq ea already has the possibility to use a moving average. It is very useful to combine this with candle breakout, because it minimizes false entries and therefore it givs a better performance. Hope you have the time to do this little change for me. …and by the way a little question, do you invest in cryptos?